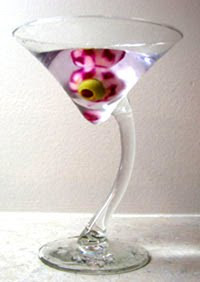 This cocktail uses 42 Below vodka, but you can of course substitute your favorite. Wow, I don't even want to know the calorie count on this drink. It has so many different fruit juices in it. 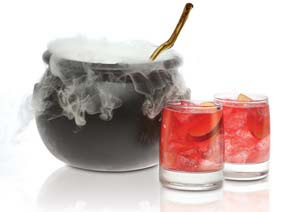 Instructions for making a Bobbing for Apples & Thyme martini, Vampire's Blood tequila cocktail, a Blood-Red Lime Rickey, a Candy Corn cordial, and more. Everything from Bayou Slime to Skeletons In Your Closet. 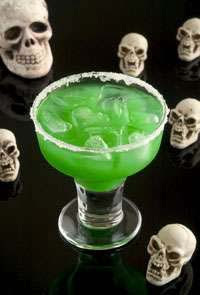 About.com's excellent list of creative cocktails for Halloween parties, including the Green Ghoul, Halloween Harvest Punch, Jack-o-Lantern, Sour Witch and Spider's Kiss. 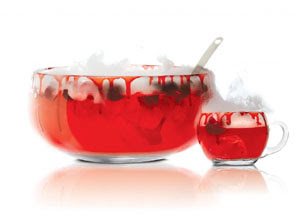 I love the way the blood oranges (if you can find them this time of year) look in the punch. 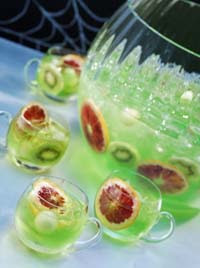 The melon balls are ingenious, I wouldn't have thought to do that. This recipe uses a radish to maximize the gross-out factor. 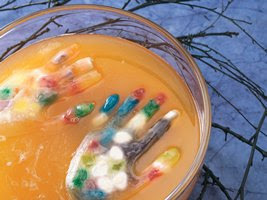 An ingenious method of using gloves to freeze your hand prints, then floating them in the punchbowl. 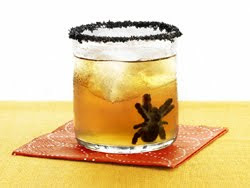 Claire Robinson's recipe includes a terrifyingly realistic gummy spider you tuck into the glass. 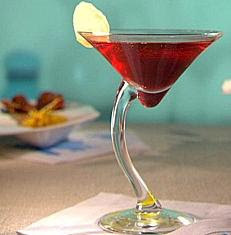 Martha Stewart's delightful twists on a screwdriver and berry martini. Hostess with the Mostess always has the coolest ideas! I love this! 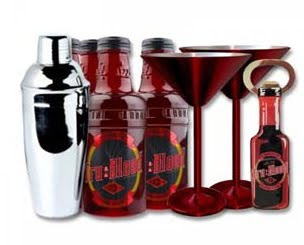 The fans over at True-Blood.net came up with these cocktails that use HBO's branded TruBlood beverage in them. Haha. Their Black Widow sounds much more forgiving than the one I'm familiar with. 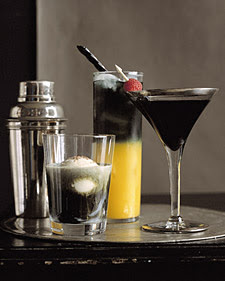 My friend came up with this drink, so called because it's a black shot followed by a red one. And it's a killer. Take in rapid succession (one for each fang, I'd imagine). Recently I have also tried a "Code Blue" (cue the TSOL song). 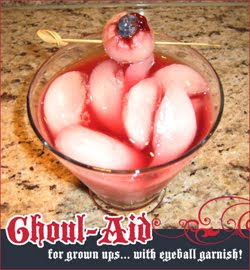 Shake with ice and pour into a tall glass, topping off with bar sours.